Our prayer, therefore, ought to be short and pure, except it be perchance prolonged by the inspiration of Divine Grace. But let prayer made in common always be short: and at the signal given by the Superior, let all rise together. 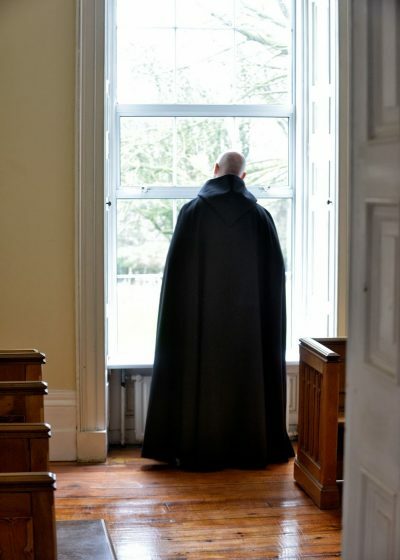 In one of the monasteries which he had built in those parts, there was a monk who could not continue at prayers; for when the other monks knelt down to serve God, his manner was to go forth, and there with wandering mind to busy himself about some earthly and transitory things. When he had often been admonished by his Abbot for this fault without any amendment, at length he was sent to the man of God, who likewise very much rebuked him for his folly. Notwithstanding, returning to his monastery, he followed the holy man’s admonition; but, on the third day, he fell again to his old custom, and would not stay within at the time of prayer. Word was once more sent to the man of God, by the father of the Abbey he had appointed there. Benedict returned the answer that he would come himself, and reform what was amiss, which he did accordingly. It so fell out, that when the singing of psalms was ended, and the hour come in which the monks took themselves to prayer, the holy man perceived that the monk, who used at that time to go forth, was drawn out by the skirt of his garment by a little black boy. On seeing this, he spoke secretly to Pompeianus, father of the Abbey, and also to Maurus saying, “Do you not see who it is, that draws this monk from his prayers?” and they answered him, that they did not. “Then let us pray to God,” he said, “that you also may behold whom this monk follows.” After two days Maurus saw him, but Pompeianus could not. Saint Gregory gives this story to illustrate three truths of the monastic life. • Silent prayer — what today we often call adoration, and practice as such — cannot be separated from choral liturgical prayer. • The devil has but one aim in view: to keep a monk from praying. The devil’s chief industry and the goal of all his strategies is to pull a monk away from this kind of prayer because the monk who practices it will soon experience its fruits. These fruits are sweet to the friends of prayer, but bitter to the devil: charity, joy, peace, patience, benignity, goodness, longanimity, mildness, faith, modesty, continency, and chastity (cf. Galatians 5:22–23). • Saint Benedict is a powerful advocate of those who are tempted against prayer, those who are drawn “out of the Oratory”, that is “away from prayer”, by distractions, dryness, physical discomfort, restlessness, weariness, anxiety about work, fear of silence, or resistance to the secret operations of God in the soul by which a man is brought to stillness and powerlessness in order to abandon himself, quietly and gently, to the purifying, illuminating, and unifying action of grace. Saint Benedict is the father, champion, and protector of souls who struggle to pray. Silent prayer before the tabernacle (or, as is our practice on Thursdays, Fridays, Sundays, and great feasts, before the Sacred Host exposed in the monstrance) is indispensable. Père Jérôme of Sept–Fons used to teach that ten minutes in front of the tabernacle was always and absolutely worth more than an hour of secret prayer in one’s cell or outdoors. For us, our prayer is magnetised by the Sacred Host, the Deus absconditus. We will habitually prefer to be still, silent, and adoring in the presence of the Most Blessed Sacrament to every other way of prayer. It is Thy face, O Lord, that I seek; hide not Thy face from me. I am here for Thee because Thou art here for me. Thou art the God of my heart, and the God that is my portion for ever. O Jesus, King of Love, I put my trust in Thy merciful goodness. Jesus, Jesus, Jesus, be to me a Jesus. If, then, you are drawn to a simple adhesion to Our Lord in the silence that unites the soul to Him in love, then let yourself yield to this silence. Should you begin to feel restless or distracted, return to your reading and, then, to the repetition of the same invocation, until the sparks of the fire of pure prayer begin to glow once again. Repeat this sequence of things over and over again, until your fixed half–hour or hour of prayer ends. Always resist the temptation to cut short your time of prayer. It is far better to prolong your time of prayer by one, or two, or five minutes than to listen for the clock and so end it in a niggardly and parsimonious manner. I should like to say something here about the Rosary. The Rosary is, at once, (1) prayer itself, (2) the seed of contemplative prayer; and (3) a means by which, infallibly, a man obtains from the Blessed Virgin Mary the grace of perseverance in prayer. The life of the Dominican Père Marie–Étienne Vayssière (1864-1940) attests to this in the most compelling way. Perseverance in prayer is always linked to the presence of the Blessed Virgin Mary in the life of a community, and in the life of the individual monk. The place occupied by the Rosary may wax and wane in the course of a monk’s life, but it must never be allowed to disappear altogether. The best thing is for a monk to use the Rosary as a form of the 57th Instrument of Good Works: Orationi frequenter incumbere, “To fall frequently to prayer”. It is disconcerting to hear Western Christians speak fulsomely of the use of the Prayer Rope by Eastern Orthodox monks and hesychasts, while sniffing condescendingly at the use of Our Lady’s Rosary by humble contemplatives hidden in the cloisters of the West. I knew one old monk, Père Raymond of Rougemont, who admitted, with great simplicity, that he prayed up to thirty Rosaries a day, and this while driving his tractor and working in the orchard in all kinds of weather. Père Raymond was often dispensed from choir, especially in the early years of his monastic life, but he compensated for his absence from choir by praying the Rosary almost continuously. 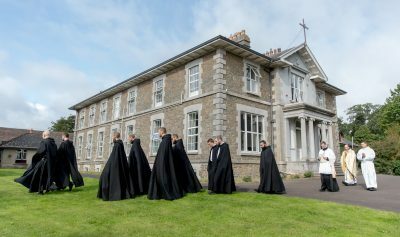 At the end of his long monastic life, Père Raymond had become a living flame of prayer, and this was, according to my calculations, the fruit of the nearly 700, 000 Rosaries that he had prayed since entering the monastery. Make use of the smallest windows of time to “fall to prayer”. Learn to “tell your beads” very humbly and simply. You need not “feel” anything in order for the Rosary to be efficacious. It is an expression of the soul’s resolve to “persevere in prayer with Mary, the Mother of Jesus” even when one feels nothing and is utterly incapable of concentrating one’s thoughts. There is a certain neurotic perfectionism that keeps a man from praying because he thinks that he cannot pray rightly, or worthily, or in a way that measures up to his own standards. Procrastination is the granddaughter of perfectionism, and perfectionism is the daughter of pride. Never say, “I shall put off praying until the circumstances are more favourable, or until I feel better, or until the weather changes”. Never say, “I shall pray later” or “I shall pray tomorrow”. The time to pray is now because a monk is man who prays always.